Ruptela is a GPS/GLONASS hardware developer and manufacturer. The company started its operation in Lithuania in 2007. For several years branches in Russia, the Ukraine, Belarus and Poland have appeared with expansion geography numbering 100 countries. 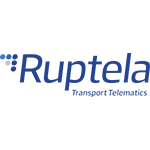 Ruptela devices are intended for online GPS-tracking. Positive connection dynamics shows that our partners and clients more and more often prefer Ruptela. The chart below shows the changes within the last 30 days in the number units of Ruptela devices type are connected to Wialon Data Center.